The horses have been stuck inside for several days now, due to the blizzard that managed to shut Chicago down earlier this week, and super-frigid temperatures today. I think they’ll go outside tomorrow, which won’t be a minute too soon for Mads. The big girl is bored. 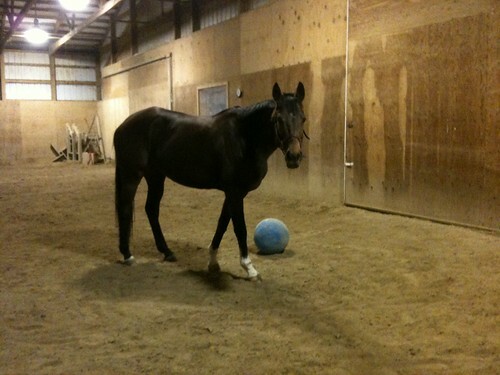 I turned her out in the arena after taking her blanket off, thinking that a good roll would feel pretty good. Mads instead strolled around the arena, even going into the corner that she sometimes spooks at (it’s full of jump poles, and birds like to sit among the poles, can’t really blame her,) sniffing the jumps, but she didn’t roll, and she didn’t run around like a nut. 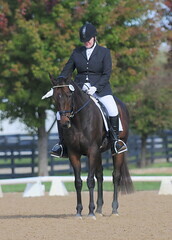 After she toured the arena, she walked over to where I was perched on the mounting block. She sniffed me head to toe, and lipped at my jacket. Then she sighed, and walked a few steps away. The mare was bored. I dug around in a corner, and pulled out an exercise ball that Jag used to play with. Mads has shown little interest in the ball when I’ve showed it to her previously. However, I remembered that the only time that Jag was really motivated to play with toys was when he had been stuck inside for several days. He wasn’t interested when he had enjoyed a day outside. I kicked it back toward her, and she started to nose it around in earnest, following it around the arena. We repeated this a few times – she seemed to really enjoy the new experience, and I like seeing them scoot balls around, it gives them a great long-and-low stretch. Maddie wasn’t as enthusiastic as Jag. Now, there’s a horse that really likes his playtime. And this one, playing with a jolly ball. Clearly, he’s not head shy. Tonight – and looking back at Jag’s funny videos – is a reminder to me how important it is to keep our Thoroughbreds mentally stimulated. They are bright, inquisitive horses, and I could see the change in Maddie’s demeanor when I brought her in from her playtime. Especially when they’re inside for a few days, changing up the routine is a good idea.